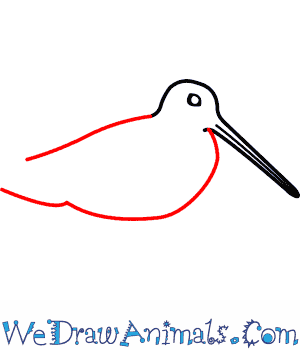 In this quick tutorial you'll learn how to draw a Common Snipe in 8 easy steps - great for kids and novice artists. 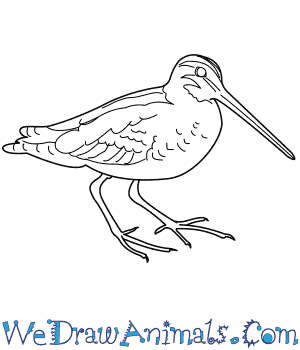 At the bottom you can read some interesting facts about the Common Snipe. 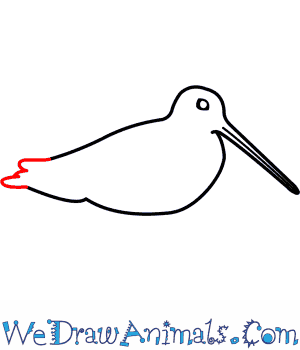 Step 1: To start the common snipe draw a very long thin "V" shaped beak. From the top of the beak line draw a round line to make the head. Step 2: Draw a long straight line from the tip of the beak to the end of the beak. In the middle of the head draw a large round eye. Step 3: Keep drawing the head line back on a diagonal angle. 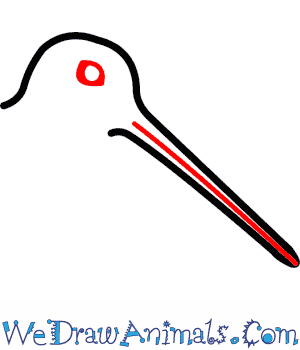 From the bottom of the beak draw a long, curved line down and to the left. This makes the belly line. Step 4: Join the ends of those two lines with a squiggly line with three small bumps to make the tail. Step 5: Starting at the middle of the belly line draw two lines down and then bend them to the right to make the leg. At the bottom of the leg draw four toes. The middle toes are the longest. Make them all pointy. Step 6: Just behind the first leg draw the second leg the exact same size and length as the first leg. Only draw three long pointy toes on the second foot. Step 7: At the bottom of the head line draw the wing down along the back line. Then curve back and follow the belly line to just above the front leg. Step 8: There are a variety of squiggly lines on the wing, tail and head that make up the feather pattern. The Common Snipe is a small wading bird with brown and white or straw-yellow plumage and a long, narrow bill that it uses to pluck worms out of soft marshy soil. Common Snipes grow to 25-27 centimeters long, have a wingspan of 44-47 centimeters and weigh 80-140 grams. They lay speckled brown and tan eggs that almost come to a point at one end. 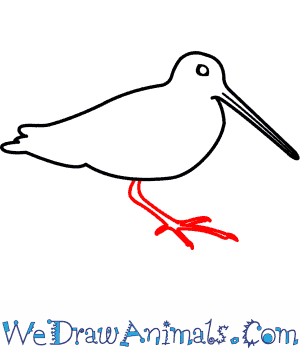 Other names for the Common Snipe include “horse gowk”, “flying goat”, “heather bleat” and “mire snite”. 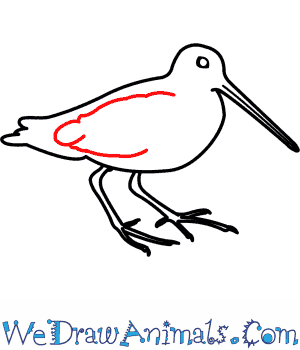 When startled, the Common Snipe will fly off in a zig-zag pattern to confuse predators. Both parents care for young Common Snipes, with the mother and father each looking over half of the babies. The male Common Snip vibrates its tail feathers to create a drumming sound that some people think sounds like a goat. This sound is meant to attract female Common Snipes. The Common Snipe is an extremely shy bird and very well-camouflaged. 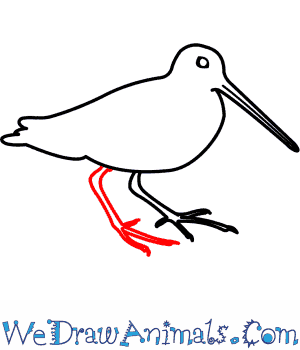 The Common Snipe is not currently a threatened or endangered species. However, there are still threats to some local Common Snipe populations. In parts of Germany and England, for example, the increase in agriculture and field drainage has decreased snipe habitat to such an extent that local populations have gone extinct. The Common Snipe is also still hunted as a gamebird in many areas.